Today’s world is changing, and tattoos are becoming more and more accepted within society. They can be used as art, as a political statement, offer personal meaning, or just help one to learn about the massive universe we live in. These 14 tattoos are of the latter variety, offering their owners, and those around them, the chance to get as close to the universe as possible without training for years with NASA. 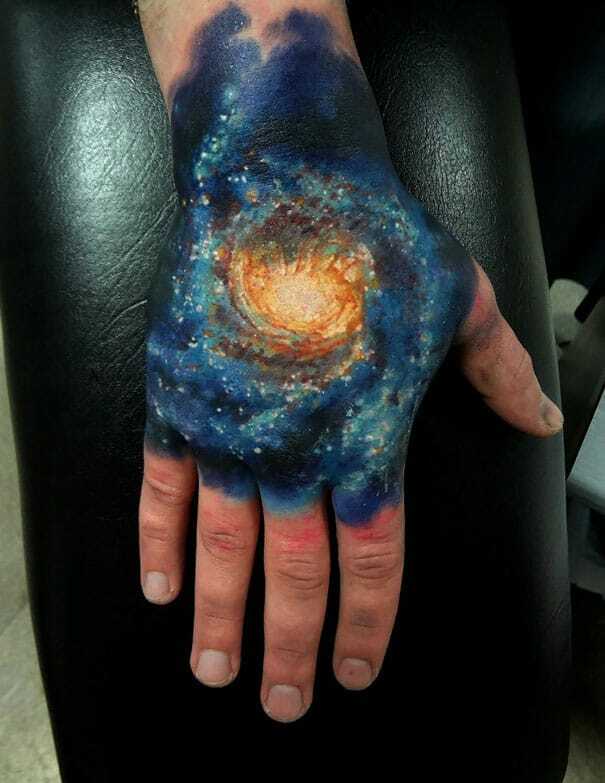 Of course, there is nothing like the real thing, but the opportunity to see some beautiful color, extraordinary vistas, and the simplest of constellations embedded upon your skin is a wonderful chance to get in touch with our universe. 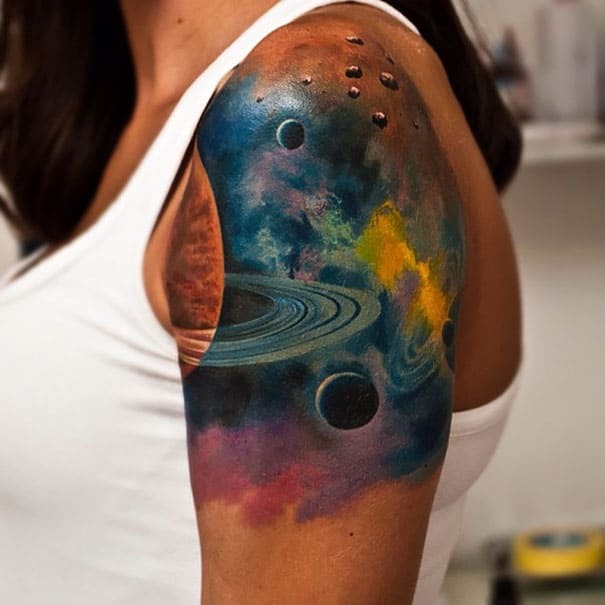 A tattoo of the universe doesn’t need to be the most detailed, extravagant work of art ever. 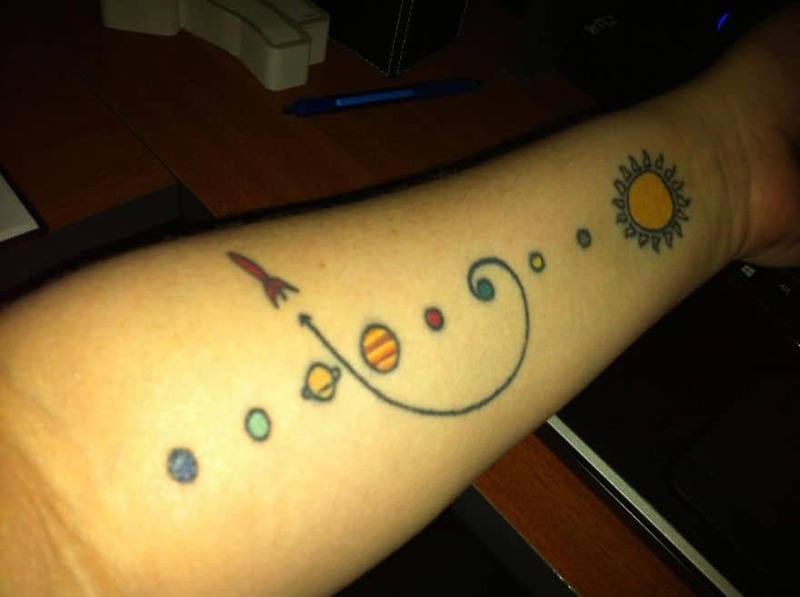 In fact, this first piece proves that you can enjoy all there is to offer within our solar system, including each of the planets and our sun, without requiring a large amount of ink to ensure everything looks to scale or perfect. The cartoon-like style of the rocket ship and the planets will allow anyone, old or young, to enjoy this piece of art on your skin. Of course, if you can name all the planets in the correct order, you may just win yourself a hug from the owner for that knowledge. No guarantees, though. You should probably know the name of the planets anyway, and there order from the sun. It may not be knowledge you use daily, but it’s still a good thing to learn. Learning is never a bad thing, after all. A tattoo, which is completely permanent, already requires a lot of heart and dedication for the owner to receive. Combine that with a love of the universe, and the entire bare surface of your chest, and everyone who sees this one will know you mean business when it comes to the artwork adorning your skin on a daily basis. 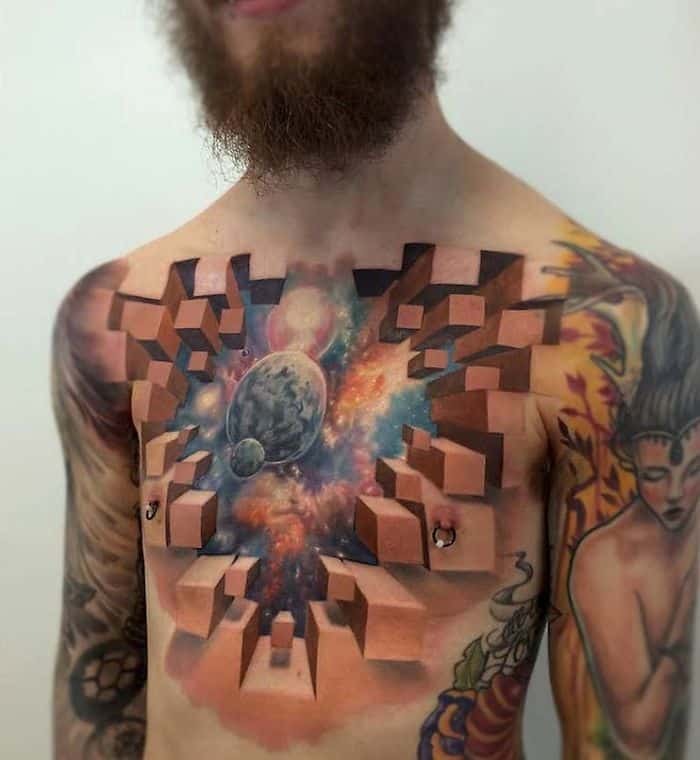 The imagery involved in this particular piece surpasses most photographs we’ve all seen of the universe, and the creative way it is embedded into the skin is unique and eye-catching, as the bricks fall away to view another world. If you can tie a tattoo like this into other work on your body, then you may just have a winner on your hands. It’s definitely not for everyone, but for those interested it’s well worth the cost and the pain you may experience. Your heart may very well be the entire universe. The arm is one of the most popular places to receive a tattoo, especially the lower forearm where there is plenty of room and the pain isn’t unbearable for most people. So, why not score yourself some new artwork by incorporating a large majority of the solar system in one place with bright colors so it stands out against the entire room. This one is definitely an eye-catcher, and people are going to notice the work from across the room. Being on the lower forearm, there is always room for expansion when the time comes to enhance the universe a little further. The top of your arm has plenty of room, after all. Even the hand can be adorned with unique colors to expand the worlds upon your arm. Let’s just hope everyone knows which planet is which when they take a look at this one for the first time. Not everything in our universe has to be correct, it can also be straight from your imagination or from inspiration taken elsewhere. A space whale, for example, surely doesn’t exist within our universe, though it would be an impressive specimen. Instead, this one is purely for fun, but it incorporates the stars into the body of the whale, offering those looking upon it the chance at seeing a little bit of both worlds. It’s simple, yet oddly satisfying. This is the type of tattoo that can fit into any area of your body effectively, though it does look rather nice on the forearm. 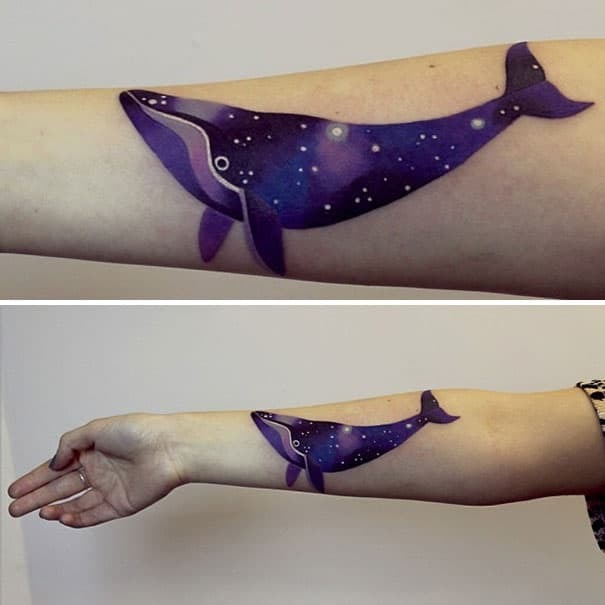 In the future, the whale could be added to, perhaps even into a pod of space whales floating aimlessly along the entire length of the individual’s arm. A background could do wonders, too, but it’s definitely not required in this case. The world really is yours for the taking, and your imagination can help you grasp that. Getting a tattoo on your hand shows even more dedication than an entire chest piece in some cases, and this individual knows what the perfect bit of art to go there is. Black holes are notorious for sucking in anything they can get within their reach, which makes it a good fit for the hand that grasps at objects on a daily basis. The coloring may be a little dark, but the stars and the center portion come to life against the background of the rest of the tattoo. This one may not be for everyone, but it’s certainly nice to look upon. Of course, tying the dark coloring into another tattoo could be a difficult task, but an experience tattoo artist may be able to manage the task at hand when the time comes. The universe is quite large, after all. Let’s just hope the black hole doesn’t destroy the other planets. If you can manage to tie multiple worlds, both real and science fiction, into one, single arm tattoo, then you have our respect in spades. This one begins on a lonely, snowy road, moves upwards to the moon, then surpasses everything we know about our universe by incorporating distant planets, what appears to be a drifting spaceship, and plenty more within a single piece. Moving up from the hand was a smart move, as it allows everything to flow upward as if you were looking up into the stars above yourself. It most likely took more than a couple sessions to complete, but it appears to be worth it. The coloring is near perfect, as it isn’t overly bright, but not dark enough to be forgetful either. The artist has done quite a good job of keeping the wonder of our world and those around us alive and well. Again, you don’t need massive amounts of color to ensure your tattoo is worthy of attraction. 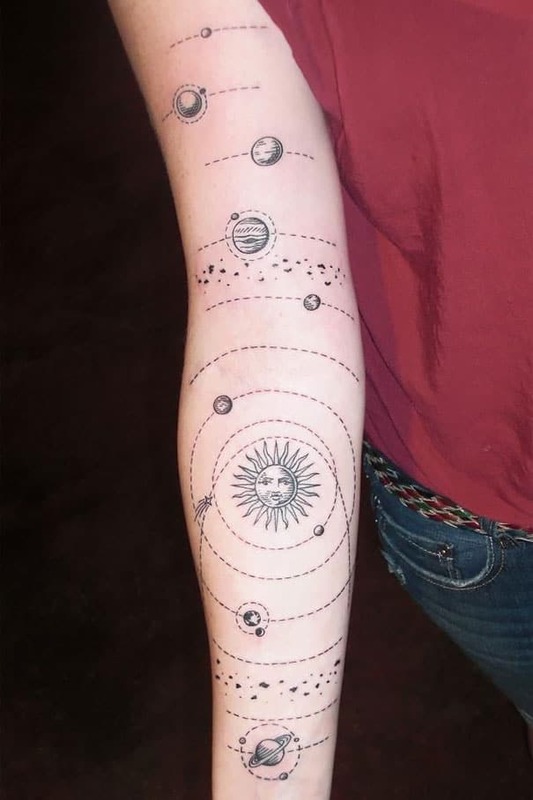 This is the perfect example of how a few lines, some simply designed planets and a sun, and a little bit extra can turn your arm into a thing of wonder. It’s a unique take on the solar system, where the planets move progressively further out from the center piece – the sun – until they reach the edge. One can almost imagine all of the dotted lines forming into circles to complete the solar system as it was meant to be seen – in a circular fashion. However, this one does work best when it hasn’t been fully completed with the lines connected, as it leaves a little to the imagination to do the rest of the work. Besides, tying a tattoo around your arm like that just for some lines on the forearm may not be worth it for the owner. Tattoos where the skin appears to be ripped open to reveal something more underneath have become quite popular lately, it appears, and with good reason, too. This, for example, is a great reason for such a tattoo to exist. Tear away the outer layer of skin and discover an entire universe, colored in red and blue with stars mixed throughout, hidden underneath, just waiting for someone to explore what else lies beneath. Of course, that would be cannibalism, and should not be practiced anywhere. If you want to find out what else lies underneath, simply ask the owner of the tattoo about themselves. It’s so much easier. 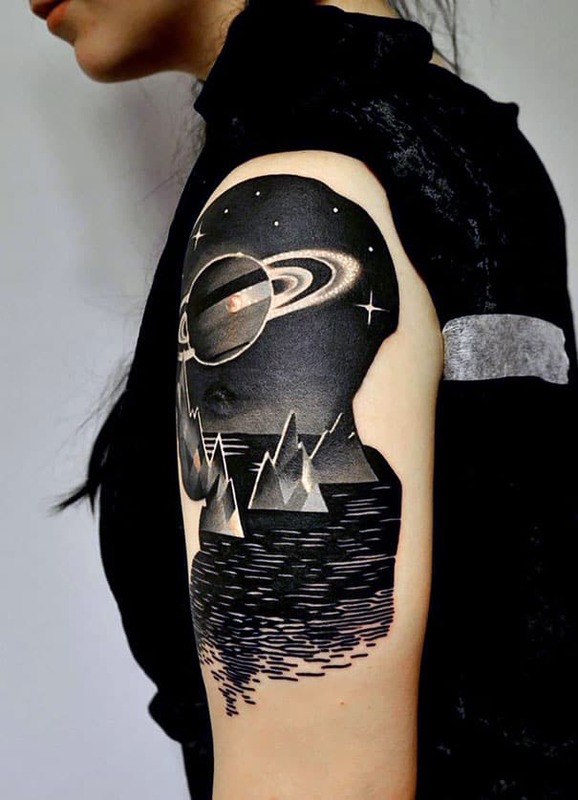 This another perfect example for a tattoo that could be expanded upon in the future, as new “tears” in the skin can be outlined to reveal even more of the universe further along the arm. It may not tie well into any other type of tattoo, but it doesn’t really need to, does it? People tend to focus on color far too often when they’re interested in getting their tattoo done in their chosen location. However, something simply, like black and gray, can do wonders against the soft flesh tones of the skin. This user made it a little more unique by incorporating the universe inside a head. Mountains or glaciers drifting in the background, and stars and Saturn floating overhead lend a hand to ensure this is a piece that you won’t soon forget. If ever there was a tattoo designed to capture your attention, this is one of those. Of course, this one pry has a lot of meaning to the owner than onlookers may never understand. The head, especially, will have something to do with a particular aspect of the person’s life, perhaps a favorite novel or author. Whatever the choice may have been for, it looks incredibly good on their skin. 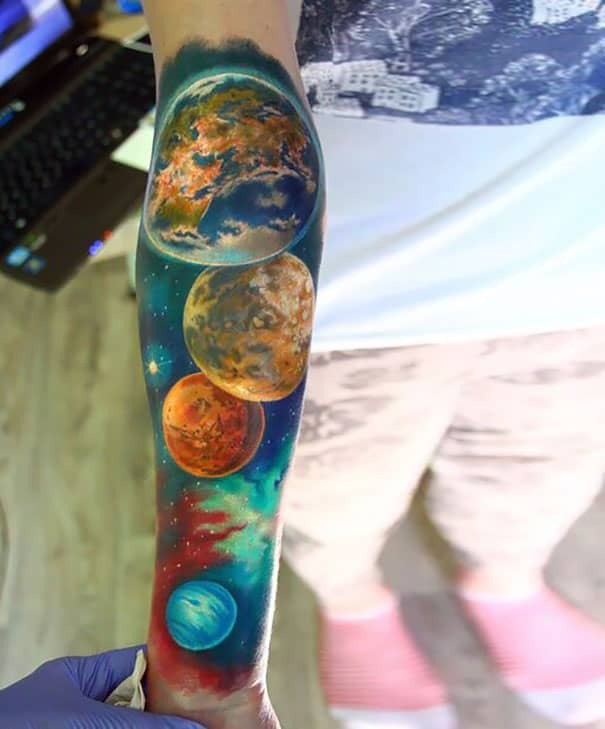 Our universe is massive, and who knows how big the other universes out there truly are, so it’s kind of hard to fit the entire thing into one tattoo. Thankfully, you don’t really need to, as the imagination is a powerful tool in most people. 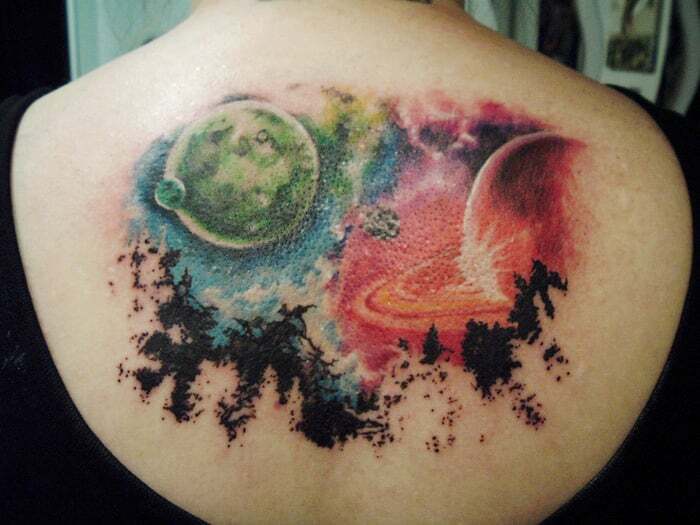 This tattoo, for example, offers just a little bit of what is out there, including a few planets, some dreamy colors, and a couple asteroids floating around aimlessly for good measure. It promises more without actually showing what else there could be, leaving you to decide where it goes from the edge of the coloring. With the location of this tattoo, the owner could go in one of four directions to continue the work should they choose to. The back is wide open, up the shoulder, down the rest of the arm, or across the chest. All offer the perfect amount of space for the universe to flourish. 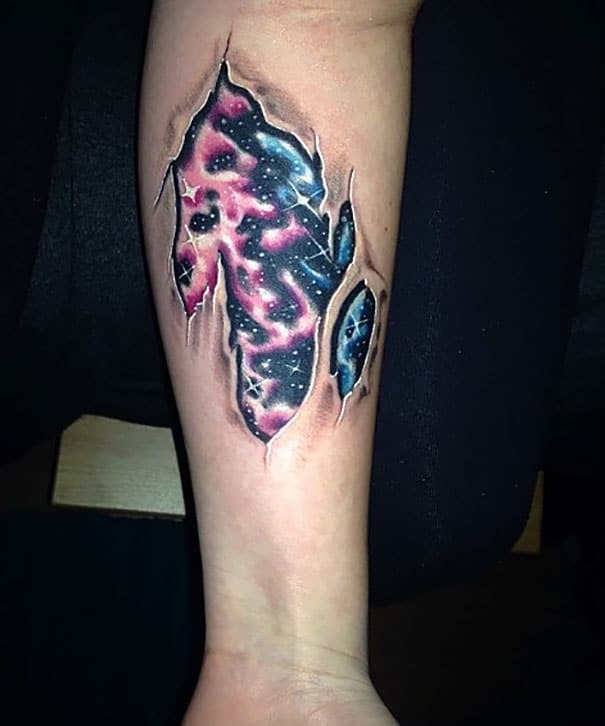 Again, tying two different worlds together through the universe of colorful tattoo ink can be a difficult process, but when it turns out correctly, like this one, then it looks magnificent. 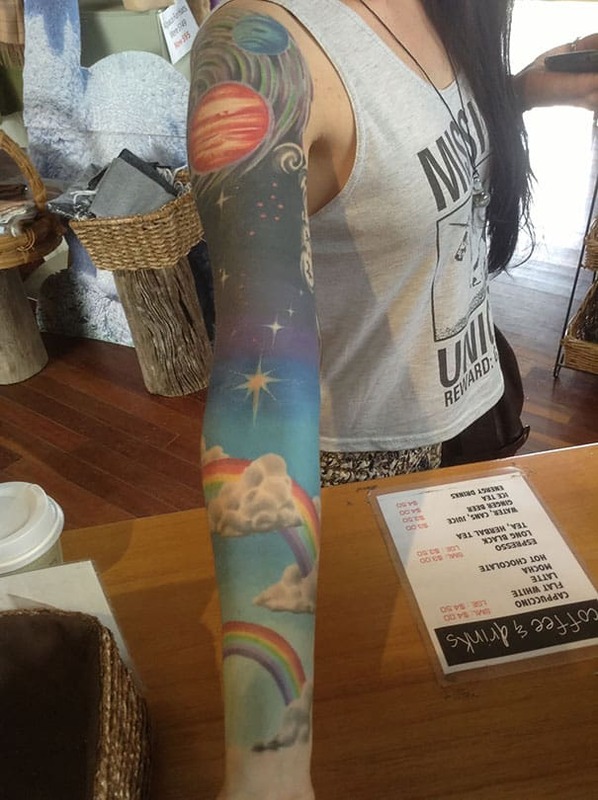 With the rainbows, bright sky, and clouds adorning the lower half of the arm, and the darkness and wide open expanse of space encompassing the top half, this is a tattoo that is going to keep everyone eyes on you at all times. The mixture of light and dark works perfectly against each other, making everything seem a bit brighter when compared against the opposite side. A tattoo can bring about plenty of feeling for both the owner and those who look upon it, and this one can simultaneously make you happy and solemn at the same time, but not overly so. It’s a unique piece, and one that deserves to be looked at as often as the owner is comfortable with. 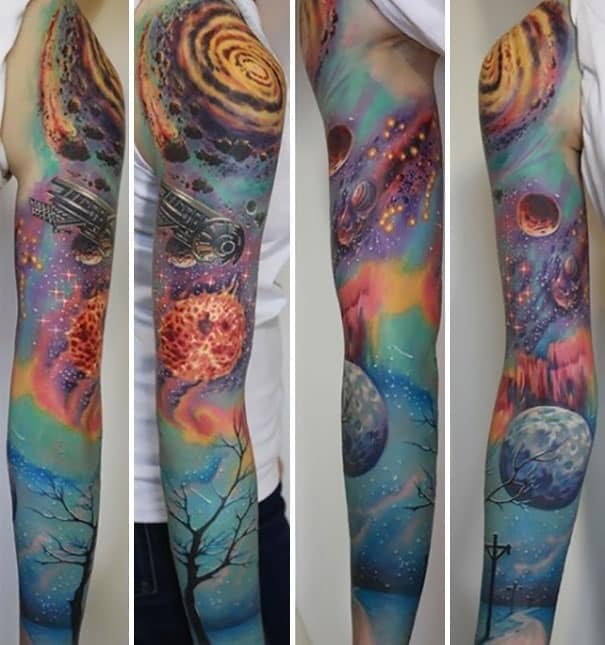 A tattoo of the universe doesn’t need to be fully done, or even as massive as some may suggest, but it can cover a small portion of your skin and still offer the same amount of wonder and amazement that a larger piece does. 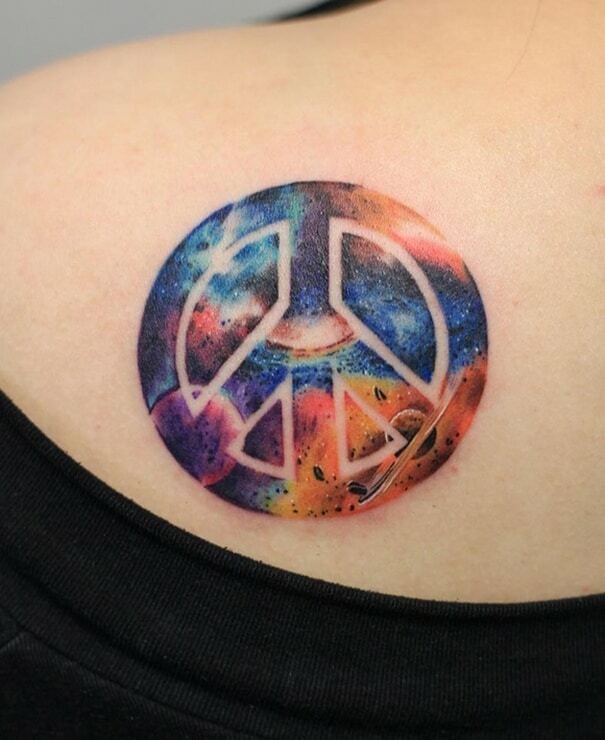 This peace sign, for example, has the universe implanted in the background, giving it a unique look when compared against other peace signs and universe tattoos. It promises something more is out there, something quiet and full of wonder. The universe is ours to explore, and we can do it peacefully. This could be a good starter tattoo for anyone looking at their first. It can be hidden well for those in a professional field, or it can be flaunted for those who simply don’t have a care in the world. Either way, this tattoo looks good on almost anyone’s body, but the original owner can always claim to be the first and original. Looking up in the sky doesn’t always grant the same sights we come to expect when they look up towards the universe in a movie or a piece of art, but we can capture that art in our own way via tattoos on our skin. This woman has ensured that anyone walking behind her can get a glimpse of what is truly out there: wonder and color. Space may not actually be colorful, but we can all dream of something more out there, can’t we? You really get a sense of looking up to the sky with this one, as the tops of the trees at the bottom portion of the tattoo give a sense of the tilted head look. Unfortunately, that’s not the case, as you’re just looking at someone’s skin, and looking too much or trying for different angles could get kind of creepy. We suggest buying a telescope to get an even better view of the universe above your own head, though. Even a sole constellation can have some meaning for an individual, and this one proves that it doesn’t need to be large or colorful to be nice looking. 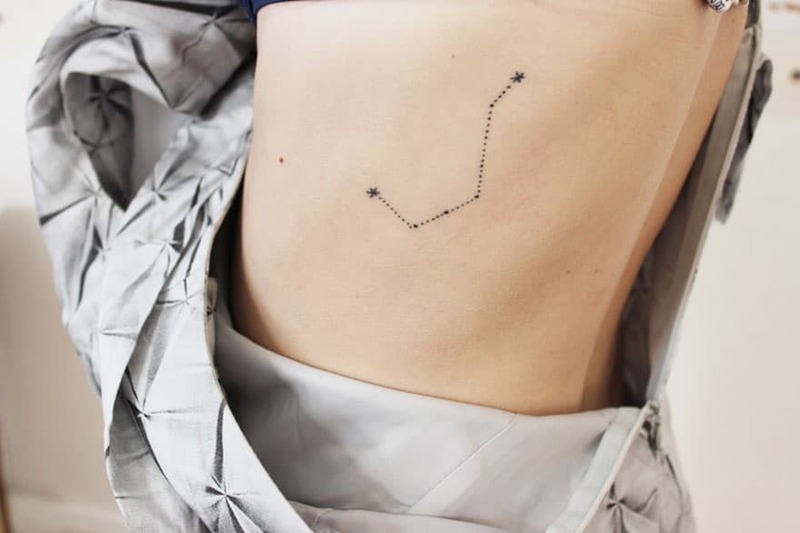 The lone constellation is placed in a great spot, it’s unassuming, and can be hidden should the owner choose to do so, but it is still there and still offering the same meaning and feeling. Being near the rib cage, this tattoo may have hurt a bit, but you can bet it was worth it. If anyone knows what the constellation in question is, you may earn yourself some bonus points with the owner should you ever come across them. Minimalism can work quite well, and this one is proof of that. This tattoo most likely didn’t take too long to complete, so anyone can sit and endure a little pain to have something similar of their heart desires so.